Use our Conservation Forms and mounts to display your artifacts with care and style. 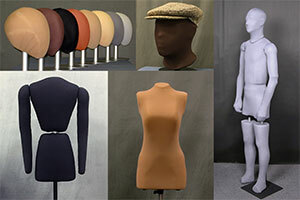 We have a complete line of forms from a full-bodied Ethafoam Man to a simple Dress Form, as well as head mounts and storage hangers; and they are all made exclusively of Ethafoam® polyethylene foam to ensure the safety of your artifacts. These forms are made of solid ETHAFOAM® with a polyester stockinette covering. They have a more realistic shape than our classic forms and can be great solutions for a “no-frills” display of artifact garments. See Examples This contemporary female form can be carved down or padded up to fit your garment. See Examples Use this form for male suit jackets or shirts. The shoulders are removable and can be carved down or padded up to fit different sized garments. See Examples This figure is a hybrid of our Conservation Form and realistic figure. It is made of ETHAFOAM® with internal aluminum pole structure, steel and aluminum arm joints, and a polyester stockinette covering. It includes head and hands and has the same posability in the waist as our Military Man realistic figure. Uses large or small Heelplate to stand. Also can use optional Waist Bracket (see realistic figures page for these items). See Examples Combining the simplicity of the Economy Conservation Form with the realistic shape and structure of the ETHAFOAM® Man, we get this hybrid figure. It is made of ETHAFOAM® and covered with polyester stockinette. The arms have flexible cable in in the elbows and wrists, and an easy-snap fitting at the shoulder. Also includes head and hands. The arms have limited posability and the torso is one piece from shoulder to hip. This form is supported by one aluminum pole which fits on an included round silver base. Male or Female. See Examples Aimed to address shallow display cases, this form is only three inches thick from front to back. It is made of ETHAFOAM® with a polyester stockinette covering. Mount it on a floor stand, table top stand, or on the wall for a ‘floating’ look. There are two widths and both include ‘shoulder pads’ to fit larger square-cut garments like football or hockey jerseys. Standard tabletop setup with a 24” pole and oval stand or 6.75” round stand. 28” height. Floor mount with 41” pole and 13” round stand. 45” height. See Examples The Economy Form has a solid interior that is not adjustable, but you can still slightly alter the shoulder width. 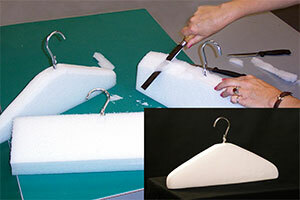 Conservators use this form to save money, and some prefer to carve the lightweight foam to a specific shape. It is also available in a child’s form. See Examples Chest sizes are small or large and can be padded to form a female or male bust line. Both Adjustable and Economy chests can have a tall neck or flat neck. Hip design is either a tapered female hip or straight male hip. All pieces can be used interchangeably to suit your needs. Removable arms attach easily to the torso, even under garments! They rotate at the shoulder and bend slightly at the elbow to give some flexibility in posing. Chest and hips move independently along 1″ aluminum tubing to adjust the height from 4′-10″ to 6′. The set of three poles allows you to display with center pole, or offset poles for trousers. The torso can be removed for easy mounting of garments. Included Metal stand is square black powder-coated steel. It is weighted, stable, and easy to move. A set screw holds aluminum tube in place and keeps it from rotating. Outer padding layer of soft 100% polyester (no sizing added) covers the ETHAFOAM® that in turn is covered by a replaceable polyester stockinette covering. You can add extra padding under or over the stockinette, and pin or stitch directly to the form to stabilize fragile garments. 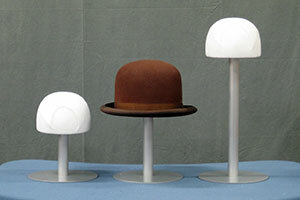 Large or small removable head is ethnic- and gender-neutral and lifts off for easy dressing. Feet are articulated at instep to accommodate different heel heights. Seated hip is available to give variety to your exhibit. The Adjustable Form has an adjustable interior construction that allows you to easily change the width of the form to fit different sized clothing. This inner adjustment can be made many times, so you can change the costumes easily and often. Use it when you want to fit a larger range of sizes. Female Head Mount – use when a more realistic female face is desired to show off your headwear. Male Head Mount – use when a more realistic male face is desired to show off your headwear. Head Mounts without features for a nondescript option. Two sizes. 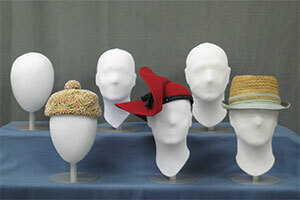 A more economical solution for storing headware. The hat mount comes in three different heights, 8″, 11″, and 15″, to accomodate your headgear and storage shelves. Choose from the economical Carve-Your-Own Hanger or the ready to use Finished Hanger. Padding and cover available as a kit. The standard covers for all of our conservation products are pure white polyester stockinette. Some of our forms can be purchased with colored coverings at an additional cost. These are either black or grey polyester stockinette, or a blend of 80% nylon and 20% spandex. Please check with your conservator to see if the nylon/spandex blend is appropriate for your use.